Blind Date's first two tests this season ended with a double victory. At the Fest der Pferde Show in Graz they received 74.94 percent in the Grand Prix and were clearly ahead of their competitors. With 78.62 percent in the Freestyle, another first place was added. "Beate" was very self-assured and expressive in both tests and rode a fantastic piaffe-passage tour. In the B score two of the five judges even gave her up to 82 percent. I am very proud of Beate - it was wonderful to win such impressive ribbons with her on the weekend. I'd like to thank my team - without all the support they give me, our great success in Graz wouldn't have been possible. 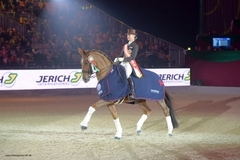 Second and third place in the Freestyle went to two German team riders, Benjamin Werndl on Der Hit (74.52 percent) and Dorothee Schneider with Kaiserkult TSF (73.67). Timma Zach and her Quantico and Alexandra Slanec with Lord of Dream took seventh and eighth place respectively. The second version of the Fest der Pferde in Graz, where there were also World Cup tests in volting, was a real magnet for spectators. In the Grand Prix, fourth place in the Grand Prix went to Alice Janout and her Wodka, the best Austrian rider.